AEIHeartUChallenge: Challenge #27–Winners and an Announcement! 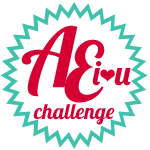 Before we get started with announcing the winners from the last challenge, we have a bit of news about our AEI♥U Challenge Design Team!! It’s great news all around, really!! First, the amazing Amy Kolling has moved up to the Avery Elle Design Team!! Amy’s beautiful work will be missed around here on the Challenge Blog, but I’m so happy that she’ll be close by and will still be creating gorgeous designs with the Avery Elle product line!! Thanks so much for your awesome contributions to the Challenge Team, Amy!! Hi, I’m Ashley Marcu. I live in a suburb near Seattle, Washington with my husband and 3 little kids. I started crafting as a full time hobby after the birth of my first child and enjoy creating every day. I love creating with stamps, dies and patterned paper. Layering is my favorite thing to do! When I’m not crafting I enjoy outdoor activities with my kids, helping out at school and watching soccer and football! Go Sounders and Seahawks! Avery Elle is one of the best companies and I am honored to create for their challenge team! Yay!! Welcome to the team, Ashley!! I just know our players are going to love you and your work as much as we do!! These two ladies totally rocked the Embossing challenge, and we couldn’t be more thrilled with their efforts!! Congratulations, ladies!! Please watch your inbox for an email from me with more information about your $25 Avery Elle Gift Certificate!! Like I said, you all made it very difficult to choose two winners. There were so many lovely projects in the gallery this month, and we wanted to give three additional ladies a shout out for a job well done! Thanks so much to everyone that played along and submitted your work to our gallery!! We have another super fun challenge that will go live for you tomorrow morning!! So I hope you’ll come back and check it out!! That’s all for now – hope to see you soon! Yay for Ashley!!! Congrats to the winners!!! Oh my goodness, thanks so much for choosing my card (and I just saw the new release and my wish list was already a mile long lol). Congrats to Melody, Claire, Anita and Isha and also to Ashley!